Born on 8 December 1834 in Sivery, France, Jean-Baptiste Rolland was ordained a priest in 1861. Fr Rolland felt called to missionary work and soon after his ordination he joined the Society of Mary. He travelled to New Zealand via Sydney in 1864 and was appointed to Napier under Fr Jean Forest. Here, Fr Rolland learned English and Maori. This was during New Zealand’s Land Wars and Fr Rolland was appointed chaplain to the Irish Catholic soldiers and their families stationed in Napier. This chaplaincy compromised his contact with Maori and it took him a while to pick up the language, though he is reported to have become fluent in English. 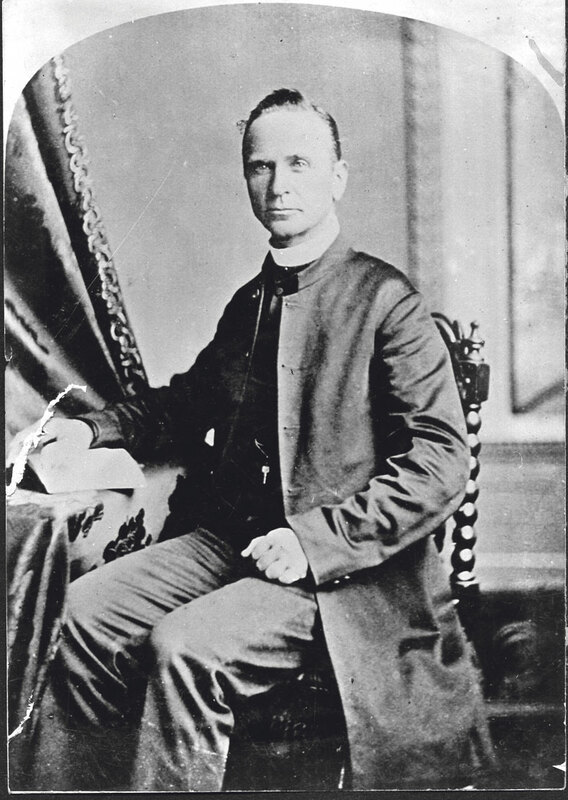 The following year, 1865, Bishop Viard appointed Fr Rolland missionary rector of New Plymouth. He continued his chaplaincy work to the Catholic soldiers and their families around Taranaki. In his report of 21 August 1868, the controversial commander of No 5 Division of the Armed Constabulary, Major Gustavus von Tempsky, singled out Fr Rolland for his exceptional courage under fire as he tended the wounded – Catholic and protestant – on the battle line. Fr Rolland was present at the battle at which von Tempsky was himself killed a few weeks after writing his report. In 1869 Fr Rolland bought a farm at Koru, south of New Plymouth, where he founded a Catholic boys’ school and a monastery for widower and single soldiers which he organised as a religious community. Unfortunately, Fr Rolland’s transfer to the West Coast of the South Island in 1872 meant the closure of the school. The monastery was also abandoned. However, several single men continued to live there for some years, but there is now no trace of the monastery. On the West Coast of the South Island, Fr Rolland was appointed to Ahaura in the upper Grey Valley where already, strangely enough, there was an academy for boys and girls which later became a boarding school. This was closed 10 years later in 1883 because the new Bishop Francis Redwood wished to concentrate all his resources in St Patrick’s College, opened two years later in Wellington. Fr Rolland then became parish priest of Reefton where he spent 19 happy years, loved by his people. During his life, several friends tried to get him official recognition for his long and dedicated service as a military chaplain. Without any apology at his death on 13 July 1903 the Armed Constabulary gave him a full military funeral before his burial in Reefton. For his day Fr Rolland seems to have been a man of extraordinary vision, founding a boarding school, a monastery and a flourishing academy in the remote West Coast of the South Island in the 1870s and 1880s. It was only his removal from the places where these institutions were thriving that caused their ultimate failure. The vision remains for us to admire.